Ronnie Ancona’s pedagogical expertise and scholarly work on Horace have produced a text that is both student- and teacher-friendly as well as informed by the latest in Horatian scholarship. Horace was a talented and innovative literary craftsman whose lyrics reveal an extraordinary facility and playfulness with the Latin language. 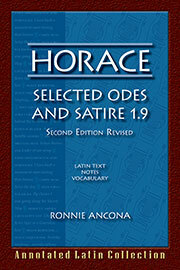 Ancona’s edition helps students begin to appreciate the nuances of Horace’s poetic art. The revised second edition features an updated bibliography and more visually appealing maps. Introduction on Horace and his times—including a discussion of some of the features of Horace’s style that make his work both challenging and exciting to read. ...wonderful...of background information and biographical references... The book really makes me want to sit down and read some Horace. 21 of Horace's poems with line by line notes an vocabulary, informed by the latest scholarship.